The route shall remain the same as in previous years. 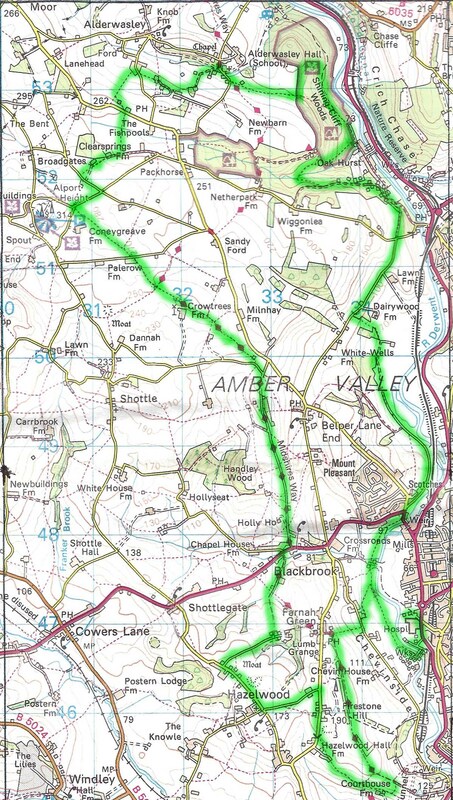 A fully indicated challenging 30km circular run or walkwith 2319′ of ascent, starting and finishing from the Belper Rugby Club’s home, ‘Strutts Fields’, through the Derbyshire countryside incorporating Roman Roads, Midshires Way long distance walk, through ancient woodlands and agricultural landscape. Safety Note: This is a multi-terrain route utilising footpaths, Bridleways and Open Roads. All roads will remain open to traffic at all times, when crossing or running along open roads, all competitors must give way to traffic and other road users, at all times. The route Crosses the A517 twice, this is a busy road, stop, look and listen before deciding to cross. Minor roads on this route are not only narrow or single track, but also maybe unrestricted ‘National Speed Limit’ roads. Please bear this in mind and step aside to let motorists past. It’s because of this, all competitors are strongly advised not to wear headphones whilst on the course. It’s advised that competitors familiarise themselves with the route and narrative prior to race day. Turn RIGHT and CROSS ROAD; proceed left up ‘Longwalls Lane’. At road junction, water/ marshal point  turn LEFT , at footpath indicator turn RIGHT and enter fields, follow marked way, CROSS ROAD near ‘Palerow Farm’, continue on marked way towards aerials. CROSS ROAD and follow indicated route through meadows DO NOT CROSS RIVER, pass UNDER bridge and turn RIGHT over bridge, at roadway turn LEFT and follow indicators to A6 ‘T’ Junction, keeping to pavement, turn LEFT , at ‘Strutts Fields’ turn LEFT and follow indicated route to finish area.